City Creek Center is an entertainment, business, and living area that takes up almost 20 acres in the center of Salt Lake City, UT. 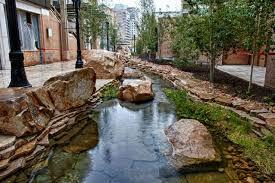 There is a man-made creek that runs through the area giving the downtown center its name. Visitors, downtown workers, and residents have access to the best shopping, dining, and hotels that Salt Lake has to offer. Getting there is easy too with the local TRAX light rail, by walking, by driving a personal vehicle, and by using the skyway that connects the main buildings of the center. Visitors, residents, and workers will find that there are a ton of great shopping opportunities at popular places like Nordstrom and Macy’s. Find a new lamp shade at Tiffany & Company, grab an outfit for a dinner date at Brooks Brothers, or pick up some trademarked Porsche sunglasses at the outlet store. Pandora and Tiffany & Co. have exceptional jewelry to choose from and Tumi is ready to outfit an army of business staff with the latest fashions in work wear and business attire. The Michael Kors store has the newest footwear fashions while Free People, Athleta, and Anthropologie have tons of stylish fashions to choose from. There is also a Microsoft store and an Apple store to fill any computer needs and upgrade orders. Finally, West Elm has everything from dinnerware to comforters and everything else for the home. Visitors will find fun souvenirs, finding the perfect birthday or holiday gift is a cinch, and business workers can always find the perfect thing to say “Thank you” to prospective clients, and it’s all in the heart of downtown Salt Lake City. 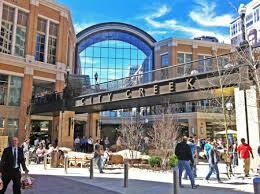 Dining in the City Creek Center is a lot of fun because there is so much to choose from. A large variety of cuisines offers diners classic dishes and trendy favorites from all over the world with the Texas de Brazil Churrascaria featuring a Brazilian-American cuisine and Sbarro pizza and traditional Italian cuisine. Other restaurants with diverse cuisines choices are Chang Chun that offers Chinese food, Bocata is a Spanish deli with mouthwatering choices, and Suki Hana treats customers to Teriyaki favorites every day. Mr. Sushi serves up classic Japanese Sushi dishes and the Cheesecake Factory has the most decadent cheesecakes ever made. For some sophistication and fine dining, visitors often check out Blue Lemon, the BRIO Tuscan Grille, Kneaders Bakery offering traditional European hearth baked breads, and Mykonos that serves gluten-free and vegetarian dishes alongside traditional Greek meals. Everyday favorites like McDonald’s, Subway, Jimmy Johns, and Nordstrom Sixth and Pine offer quick meals for people in a hurry or those on lunch break can order from restaurants that delivery. Mexican fare can be found at the Taste of Red Iguana and the Roxberry Juice Company has fresh smoothies in Salt Lake. Finding a place to stay while in Salt Lake is really easy with inclusive stay over packages. Visitors who stay in the downtown hotels get a gift card, a free gift, or a savings booklet with their stay. 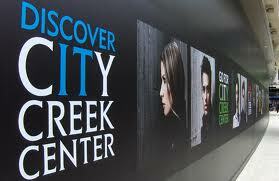 All savings are for the City Creek shopping center. There are a lot of different amenities available like spectacular guest room views, free parking, king size beds, adjoining suites with living and dining rooms, shuttle service back and forth to the town center, free wireless, breakfast, and concierge service. Visitors, family members, and out of town clients will all feel right at home with many choice restaurants, expansive stores to shop, spectacular, breathtaking views, and comfortable, large beds to sleep in at night. Some of the most popular places to stay at are the Marriott, Salt Lake Plaza Hotel, Crystal Inn Hotel & Suites, EconoLodge, Holiday Inn Express, the Hampton Inn, the Hilton Garden Inn, and the Courtyard at Marriott. Downtown Salt Lake has everything residents, visitors, and workers could need with shops, restaurants, places to rent or stay overnight, and plenty of scenic views. There are enough shops and restaurants to go to a different place every day of the week offering new and exciting cultures and unique gift items. Travelling in the downtown area is easy by bus, bicycle, taxi, when driving a personal vehicle, or by simple walking. Are there pet friendly places in downtown Salt Lake? What kind of attractions are nearby? Yes, some of the hotels offer pet friendly rooms so Fido can accompany the family on their vacation. Petco is a short drive outside of downtown for animal food supply and pet care products. There are several dog parks around the downtown area including Herman L. Franks Park, Rosewood Park, Utah Dog Park, and Tanner Park. Boondock’s Family Fun Center has go carts and arcade games for the whole family. Lagoon Amusement Park has more than 40 different rides and Clark Planetarium is sure to wow the stargazer in the family. The Hogle Zoo has been around for decades and makes the perfect place for a family fun day. The Loveland Living Planet Aquarium, Discovery Gateway, and the Natural History Museum of Utah are also great places to take the family. Whether alone, on a business trip to Salt Lake, or on vacation, The Leonardo Museum, the Gallivan Center, and Thanksgiving Point are wonderful must-see places. Don’t forget to check out Double Key Treasure Hunts for an exciting adventure. Are there any free events that go on in the downtown area? Yes, the annual International Days Festival goes on every August. Aquatic Animal Adoptions are hosted by the Living Planet Aquarium. Oktoberfest is always a popular festival and there is no entrance fee. Party in the Garden Park, Ferragosto! Italian Festival, Fire, Earth, and Wind Millcreek Venture Out Series, the Blue Moon Festival, Hoops, Hops, & Howlers Millcreek Venture Out Series, and the Downtown Farmer’s Market are all free to enter. There are other free activities that require registration like Project Oxygen with Mark Miller Subaru. There is a summer flea market that goes on in the downtown area every year, it is free as well. Free concerts are hosted in Pioneer Park every Thursday during the summer as well.